Wheatfield, NY - Workers Valerie White, Jim McKinney and Anthony Frail sort bottles at the newly opened Empties For Empower bottle return on Niagara Falls Blvd. What: The ribbon cutting and grand opening ofEmpties for EmpowerMeadowbrook Locationand Day Habilitation Without Walls, two New York State funded programs that provide job training and meaningful daytime activities to people with intellectual or developmental disabilities. 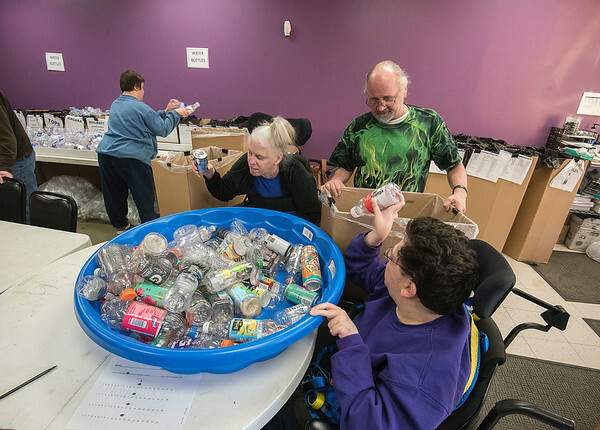 How: Empties for Empower is a free can sorting service that anyone can use. Workers are people with an intellectual or developmental disability who are receiving paid job training. This location also serves as the hub for Empower’s Day Habilitation Without Walls program in which people with intellectual or developmental disabilities go on outings and participate in their community.